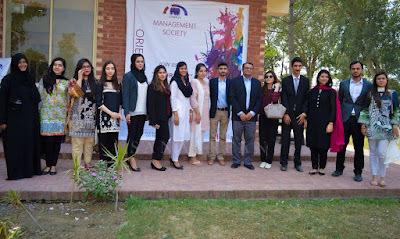 Azfar Hasan CEO Matrix Sourcing with students after delivering a talk on Advanced Operations Management. 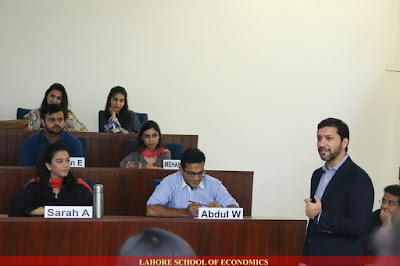 Mr. Azfar Ali, Head of Operations at Metro Cash & Carry visited the Lahore School of Economics on 26 October 2017 to give a talk on “Operations Management” to MBA graduating students. 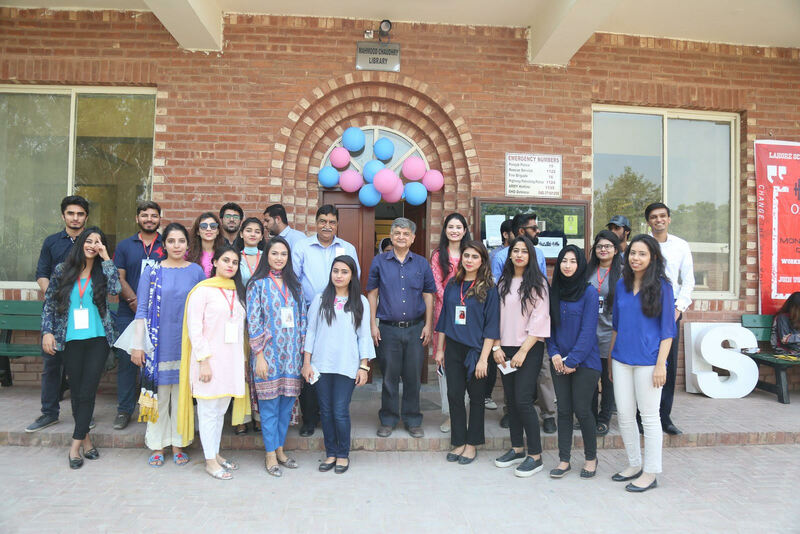 Mr. Usman Bhatty, Business Executive Officer at Nestle visited the Lahore School of Economics on 26 October 2017 to give a talk on “Consumer Behavior” to the MBA graduating batch. Mr. Salman Khalid, Senior Manager Risk HBL was invited to the Lahore School of Economics on 25 October 25, 2017 to deliver a lecture on “Risk Management” to the final year BBA students. 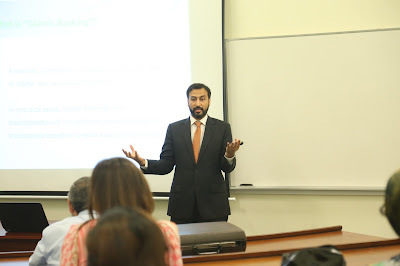 Mr. Syed Asad Rizvi, Regional Executive Director, ORIENTmMcCANN delivered a lecture on "Consumer Behavior" to the graduating MBA class on 25 October 25, 2017. Umer Ghumman, Country Head Samsung Mobiles Pakistan delivered a talk on Sales Force Management. Nashmia Haroon , Director Nashmia Haroon Studio visited the Lahore School of Economics twice on 3 October and 6 October 2017 to deliver lectures to BBA II students on Photography. Mr. Umair Shabbir, Resident Vice President HR (Specialist Islamic Banking), Faysal Bank visited the Lahore School of Economics on 18 October 2017 to give a talk on “Islamic Banking” to the Business School faculty members. 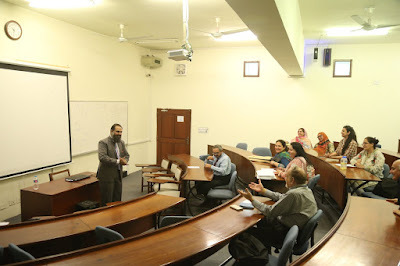 Mr Umair covered different topics from difference and comparison between conventional and Islamic banking (deposit and financing sides), interest / riba, Islamic way of economic dealings, Islamic financial systems, difference between profit in trade and interest in loan, structure of Islamic model of banking, Islamic banking working model to Islamic banking in Pakistan. 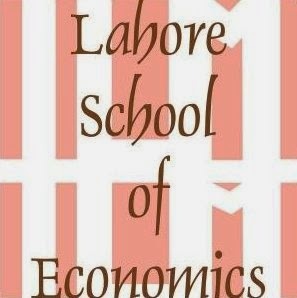 The latest issue of the Lahore Journal of Economics (Volume 22-SE, September 2017) is available now online. Chaudhry, Jamil, and Chaudhry focus on the Pak-China Free Trade Agreement 2006/07 and find that exports and imports have both risen but that firm level productivity and value-added have fallen, both in the sectors made more vulnerable (by reductions in Pakistan’s tariff rates) as well as in the sectors that China has given greater access (by reductions in China’s tariffs). Uppal looks at the sustainability of Pakistan’s external debut by focusing on yields on the country’s Eurobonds and the spreads on the Credit Default Swaps (CDS) traded in the international markets and concludes that decreases in bond yields and CDS spreads may signal that the country’s external debt is currently at sustainable levels. 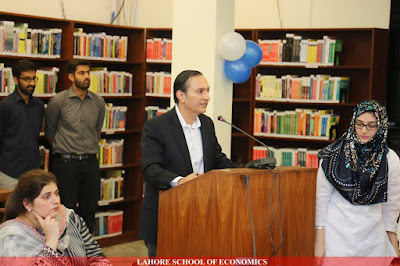 Iqbal, Din, and Ghani look at the relationship between the fiscal deficit and economic growth in the case of Pakistan, and find that the latter is compromised when the deficit exceeds a threshold of about 5.6 percent. 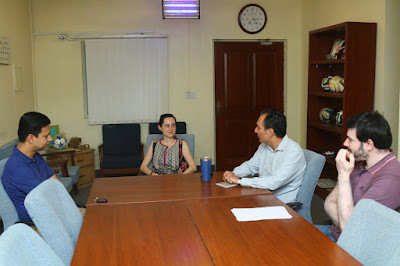 Hamid and Mir analyze the extent of exchange rate overvaluation in Pakistan and focus on how prior to March 2013, the policy target of exchange rate management was the stability of the real effective exchange rate while the current government’s policy target has been the stability of the nominal exchange rate against the US dollar. Mangla and Hyder investigate the monetary policy effectiveness of Pakistan and they find that monetary policy is quite effective in stabilizing consumer prices and the real exchange rate in the economy. Khalid analyzes how financial deepening could lead to changes in the behavior of economic agents and then presents empirical evidence on the link between financial and trade integration and growth using data from a sample of countries from the Asia Pacific region. Rasiah discusses how capital accumulation and macroeconomic management were critical in quickening economic growth in East Asia, and analyzes how investment regimes, sources of finance, technological upgrading and policy frameworks explain economic growth in Indonesia, Malaysia, Philippines, South Korea and Thailand. McCartney looks at the case of Bangladesh as an example of a country that is at risk of falling into the “middle income trap” and argues that structural change is necessary for sustained growth as opposed to productivity, competitiveness and technological change. Ejaz and Hyder examine the vulnerability of demographic groups in Pakistan to business cycle fluctuations and find that older and younger are more vulnerable than middle-aged workers, women and employers also tend to be more vulnerable and that more education is not always protective against business cycle fluctuations. Hussain and Said look at the role of income diversification strategies amongst rural households in Pakistan in raising living standards and they find that households that diversify have higher income and spending as compared to households that specialize in a single occupation, and that households with diversified occupations also tend to plant a larger number of crop types. 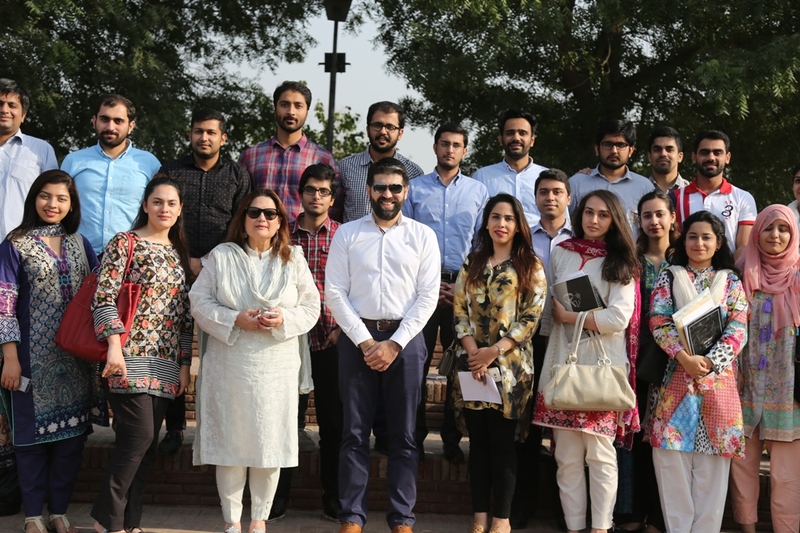 Rizvi, Naqvi, and Tanveer study the various models of mobile banking in Pakistan and then touch upon the ecosystem that needs to be built in Pakistan to utilize the full potential of mobile technology. 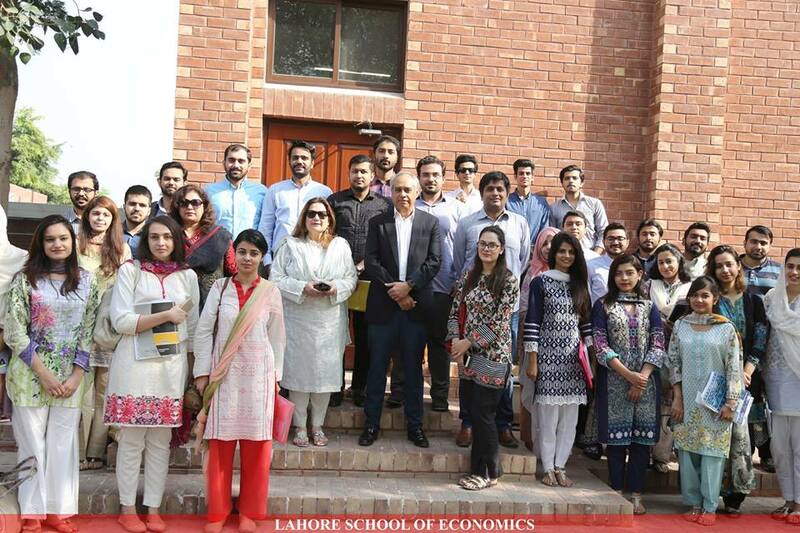 These articles as well as all the articles from older issues of the Lahore Journal of Economics are available here. Lahore School of Economics’ Fourteenth Annual Convocation was held on 14 October 2017. 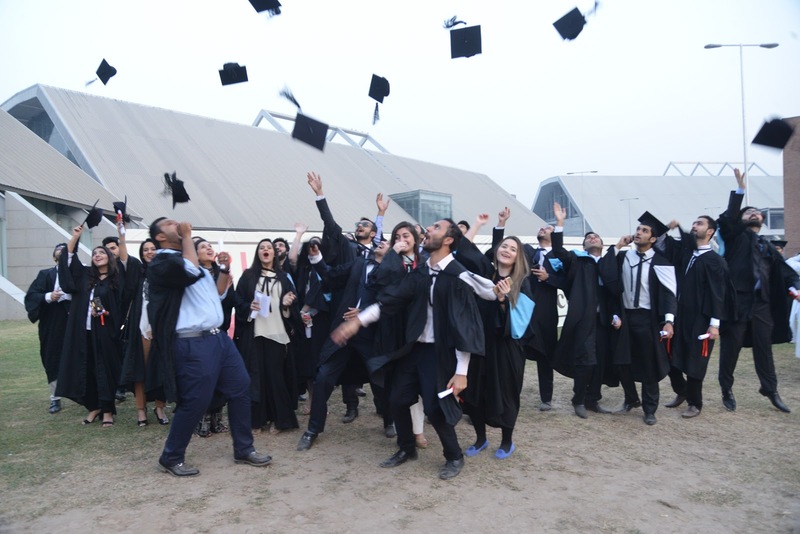 Dr. Shahid Amjad Chaudhry, Chairman and Rector Lahore School, conferred degrees and awards upon graduating students. Dr. Shahid Amjad Chaudhry welcomed parents, students and the members Lahore School Board of Governors at the convocation ceremony. 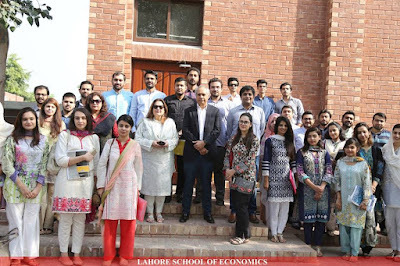 Mr. Badar Khushnood, an alumnus of the Lahore School of Economics from the 1998 batch, was invited at the Technology Management & Innovation Centre of the Lahore School of Economics on 10th of October 2017. Mr. Khushnood is currently working with Facebook as a Product Growth Manager for Pakistan and is also the co-founder and Director of Bramerz, Pakistan’s leading Digital & Social Media Agency. 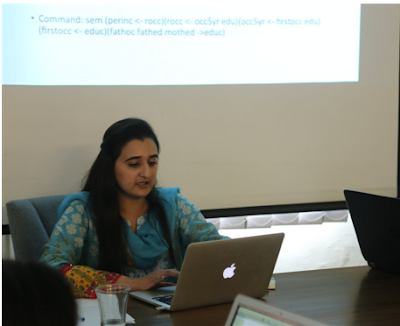 Mr. Khushnood also served as Pakistan Country Consultant for Twitter and Country Consultant for Google Pakistan. 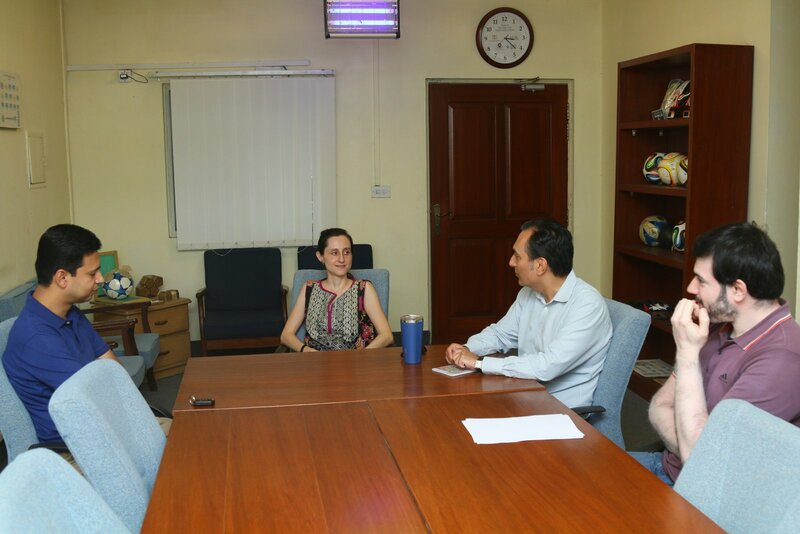 Dr. Azam Chaudhry, Dean Faculty of Economics, elaborated some of the major projects being carried out by the Technology Management & Innovation Centre and also discussed the prospective of collaboration with Bramerz with some of the forthcoming projects of the centre. The meeting was also attended by Dr. Theresa Chaudhry, Professor of Economics & Senior Researcher and Umair Ayaz and Saman Khan (Researchers at the Technology Management & Innovation Centre). Mr. Muneer Ahmad Josan, Regional Head Central Punjab - Islamic Banking, HBL delivering lecture on Islamic Banking to Lahore School of Economics on faculty on 9 October 2017. Development related funding is critical for the long term growth of any country, but the allocation of funds between politicians and different areas can vary due to various factors and one of the reasons can be strong connection of politicians with those who approves or allocate these funds. This paper tries to find out that does the strength of political connections impact the allocation of development schemes across politicians? Do politicians favor their own constituents with higher value or more popular development projects? and Does the allocation of development funds impact the decisions of voters in elections? According to literature politicians do favor those who are well connected with them but at the expense of the welfare of general public. Developmental schemes data of Faisalabad district has been used to answer these questions, where we have used data from 2010-2016 with the total development schemes of 6900. Faisalabad district has 8 towns, 11 national assembly constituencies and 22 provincial constituencies. TMA’s, district government and provincial government approves the project of MNA/MPA and also allocate the funds to them. OLS regressions and Logit model has been used for the estimation of the hypotheses. 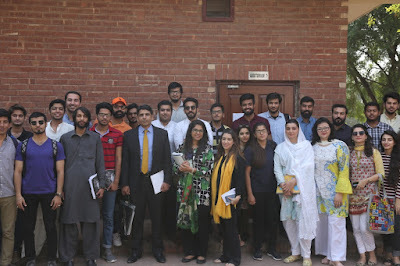 Results show that strength of connection, electoral strength and party affiliation significantly impact the allocation of development funds in Faisalabad. Further if MNA/MPA spent more money in his constituency he managed to secure more votes in the next general election. 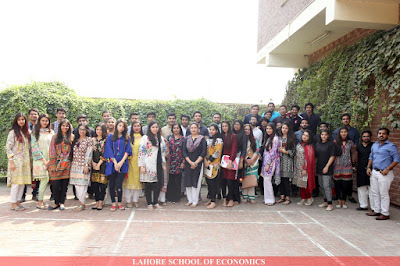 The Lahore School of Economics Finance and Investment Society. Lahore School Social Welfare Society orientation held on 3 October 2017. 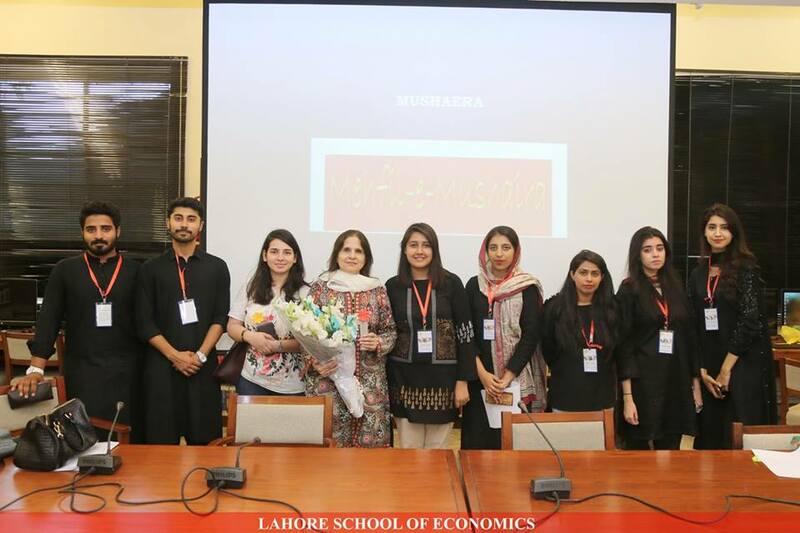 Two Lahore School researchers, Maryiam Haroon and Zunia Tirmazee, conducted a workshop on Structural Equation Models 1 (Introduction) Course, on 20th September, 2017, at the Centre for Research in Economics and Business (CREB) of the Lahore School of Economics. The researchers introduced participants to a working knowledge of structural equation model basic topics, including model assumptions, model estimation, parameter constraints, multiple group models, construct and measurement equation equivalence across multiple groups and its execution on STATA. 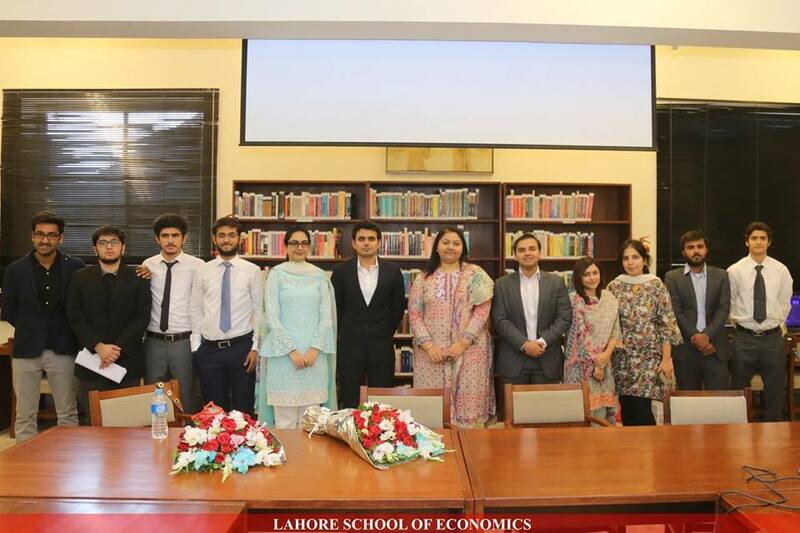 A batch of four PhD students of the Department of Economics (Farah Said, Maryiam Haroon, Nida Jamil and Zunia Saif Tirmazee) from the Lahore School of Economics visited the University of St. Gallens (Switzerland) in Summer 2017 to attend a two week Global School in Empirical Research Methods (GSERM) workshop. GSERM is a distinguished integrated program for PhD students, postdocs and practitioners from leading universities all over the world offering a course-based learning experience. 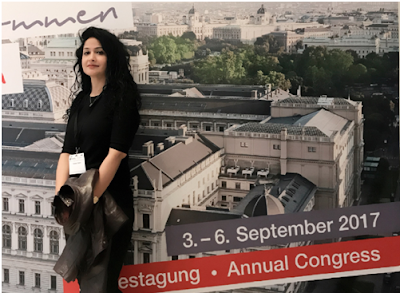 Our participants got an opportunity to learn at a great place and to meet people from throughout Europe and elsewhere. 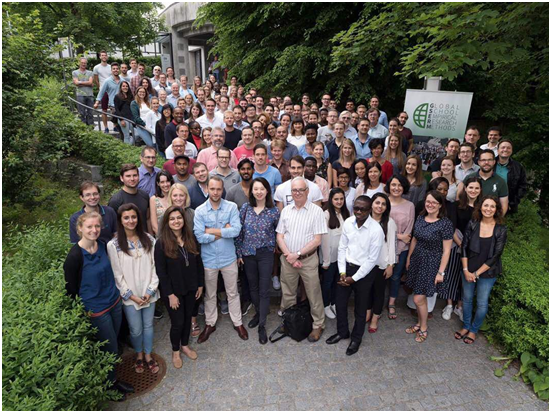 Participants chose to enroll in Structural Equation Modeling I and II, Experimental Methods for Behavioral Science and Econometrics of Big Data from over 100 different courses (one course per week, 4 ECTS each). Our students found it to be a unique experience giving them a lot of new insights in their respective fields of research and an attractive opportunity to interact with their fellow students and professors. Shaheen Naseer, Research and Teaching Fellow at the Centre for Research in Economics and Business (CREB) of the Lahore School of Economics presented her paper at 78th Annual conference of The Vereinfür Socialpolitik 2017: “Alternative Structures for Money and Banking” September 3rd – 6th, 2017 at the University of Vienna, Austria. At this conference, the core ideas underpinning the alternative architectures pertinent to money and banking were reviewed, and also their consistency, completeness, and prospects of adoption were assessed by leading and experienced representatives in the field: Michael Kumhof (Bank of England) and Albrecht Ritschl (London School of Economics). 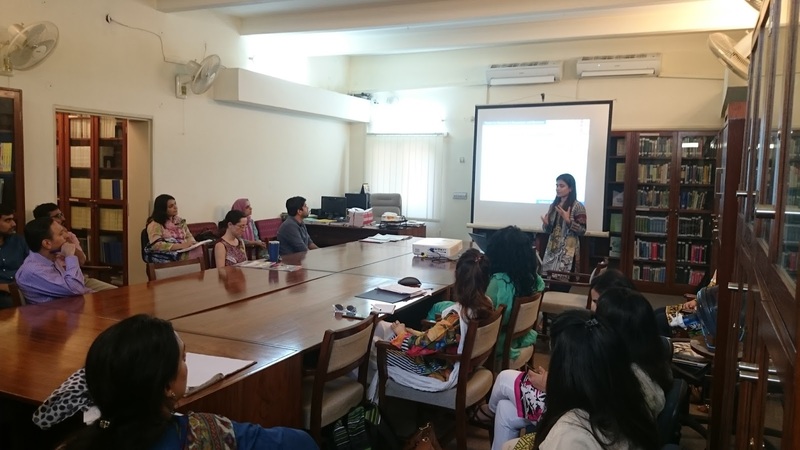 On Wednesday, 27th September, 2017, Ms. Farah Said gave a tutorial on "Designing survey instruments for electronic data collection using Survey CTO (based on Open Data Kit [ODK])" at the Centre for Research in Economics and Business (CREB) at the Lahore School of Economics.